There are several retirement plan options available to business owners. Each plan comes with its own set of benefits and requirements. This course explores the advantages and incentives of creating a retirement plan, as well as discussing the differences and statutory requirements for each plan. 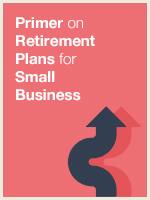 Identify the various retirement plan options for small businesses. Differentiate SEP, SIMPLE, and qualified plans. Recognize the differences in SIMPLE IRA and SIMPLE 401(k) plans. Identify the statutory requirements for operation of qualified plans, such as 401(k) plans. Calculate the maximum amount of income that can be deferred through the use of various types of retirement plans available to small businesses. Recognize the tax consequences of distributions from the various retirement plans.